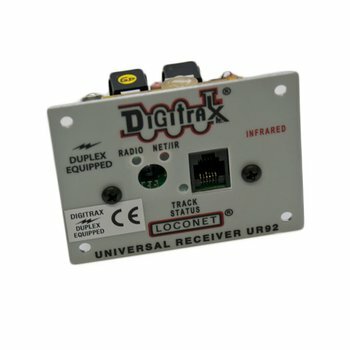 UR92CE is a combination Duplex Radio Transceiver and Infrared Receiver panel that lets you run your trains without plugging in. Pick up your Duplex equipped "DCE" throttle and you're ready to go. Also equipped with an IR receiver the the UR92CE also allows you to go wireless with your infrared equipped Digitrax throttles. Digitrax Duplex Radio (DCE) products are for use in the EU For use in the United States, Canada, Austraila and New Zealand please order "D" version.